So, you’re getting married and have decided that a band isn’t your style; you just want to find and hire a DJ for a rocking reception. GREAT ! Now, what? What are the steps you’re going to need to take to find the perfect DJ fit for YOU and your idea of the Perfect Wedding? Let’s explore that issue. I am going to be writing a series of blogs on how to find and hire the best DJ you can find for your money. I’ll also explore some of the pitfalls, roadblocks and frustrations you’ll find along the way. LET’S GET STARTED…. 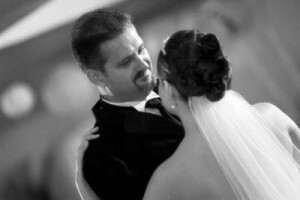 Your DJ will be in charge of the “soundtrack” for every memory created on your wedding day. He will be your narrator. He will be your “representative” for 4-6 hours. His music programming skills and ability to read a crowd will determine if your guests dance all night or make an excuse to leave early. In other words, your DJ will play a huge roll in the success of the biggest party you will probably ever throw for your friends and family. What kind of impression will he leave on their minds? Do you care how old or young the DJ is? There’s a LOT to be said about Experience, especially at a wedding. Think about the music you want to hear and will the DJ be willing to play it? Or, does he have his own agenda for music and is not very flexible with it? Do you have traditions the DJ needs to know about, and can he/will he be able to accommodate? Consider all these things first and you’ll be able to create a short list of DJ’s very quickly when the ones you eventually meet with don’t stack up.